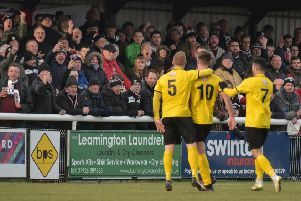 Racers were 4-0 up by half-time on their way to an eighth straight win, maintaining the form which had seen them crowned Midland League Division One team of the month for January. With Luke Cole and George Curry unavailable, Chris Johnston and Danny Bartle returned to the starting line-up with Johnston marking his recall with a man-of-the-match performance. Just two minutes had elapsed when the visitors took the lead. Ben Mackey was tripped by Callum Willimont and the striker picked himself up to lash home the resultant spot-kick. Tyrone Burton was not far from sliding home an equaliser for Hinckley a few minutes later but the ball just evaded him. Johnston curled a shot just wide of the far post, Marc Passey slashed a shot just wide and Mackey had a second chalked off for offside before Trea Bertie added Racers’ second in the 18th minute courtesy of a superb twist and shot into the bottom corner. Charlie Bannister saved an effort from the hosts and then turned provider with his superb long ball finding Bertie who controlled well before slipping the ball into the net for his second and Racing’s third in the 37th minute. Richard Powell cut inside and fed Bertie who narrowly fired wide and a Bertie shot was deflected for a corner from which Bartle’s delivery was met by a powerful header from the unmarked Joe Smith at the far post for the fourth. Liam Cross then had an effort cleared off the line for Hinckley as Racers went in at half-time with a comfortable four-goal cushion. Bannister did well to tip over a long-range effort after the restart and a fine through ball from Jack Cresswell released Bertie whose shot struck the post, with George Warren saving well from Mackey’s follow-up effort. Mackey almost got his second after strong play held off the defender but Warren saved well. The fifth was a fantastic team goal. Mackey slipped in Bertie and although Warren saved well, Henry Leaver laid the loose ball square to Mackey who blasted high into the net. Warren saved again from Leaver and pushed a Bertie effort on to the post before he combined with Cross to deny Mackey his hat-trick. 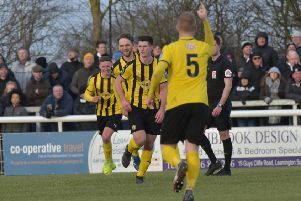 Hinckley did grab a consolation in the final minute of normal time when Burton was upended in the box by Lewis Hayden and Belcher stepped up to send Bannister the wrong way.